Hey peoples! Gosh it's been a while! We're coming up on the 1st Birthday of PAINTBAR, which has been keeping me plenty busy. We've also started on a bathroom remodel -- shout out to our contractor who worked for the first couple of days practically in the dark, #thanksmatthew. This master bath reno by Sarah Sherman Samuel was my pinspiration for what we're doing. 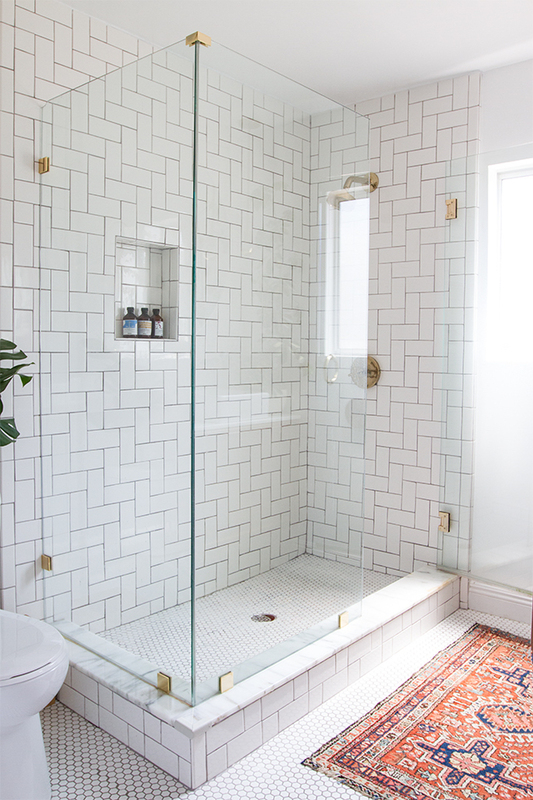 I love the added interest with the tile herringbone pattern + the gold-toned fixtures. I ended up going with this shower + tub combo and this sink faucet by Delta. We used the Trinsic series at PAINTBAR, thanks to our work with MA Allen Interiors, and we've loved the look. So basically I can't escape the salon...it's everywhere. We're going to lay our tile similarly and use a darker grout; our shower recession is going to carry through the hexagon tile from the floor to add a little extra something. I've picked out these lights for our vanity which my mom called "a little too modern for her". Sorry Peggles. I also found this amazing lighting shop on Etsy that has sooo many fixtures I liked. I'm thinking about something like this fabulous chandelier or maybe this Sputnik style fixture for my Zen Room (see Instagram) and you cannot beat the price. I'll share our before and afters when we finish! Love everything you've picked. Can't wait to see the finished results! Furthermore, sprinkles of water won't have the capacity to achieve different zones of the washroom on the off chance that you have a segment that confines and walls it in. Bathroom remodeling project is always a challenging. But seeing how you are starting it, you are on the right track. Cannot wait to see the final photos of your new bathroom. Public Relations consultancies consider the marketing needs of their clients and then try to meet them by creating public relations campaigns. Public relations campaigns usually involve the use of free editorial coverage in the press in the chosen sector for the organisation. The value comes from the improvement in the quality of life you experience while you are living in the home. Not every home investment is going to add value to the selling price, and some "improvements" such as a pool or a shoddily done add-on will actually detract in a major way. A Texas rigged worm can be worked hundreds of ways. The key is to try different presentations until you get a bite then repeat that same presentation. I like to keep my rod at the 9 O'clock position and work it to the 10 O'clock position. I will let the worm sit on the bottom with slack line then give the worm a little shake on a slack line just barely moving the worm. Last time I checked the calendar, it was 2010, not 1910. Nobody uses those anymore. I've never heard of anyone doing anything with oil tanks except hiring people to remove them. You need to get a 90% or 95% efficient gas furnace. The biggest problem with this product is that the budweiser brand is too synonymous with drinking just to get drunk, tailgating, and drinkability. Yet, this product seems to be trying to sell that it is a great tasting ale for the micro-ale lover. If you have a passon of photography, then take camera and go on taking shots of nature you like. There are many ways to make diploma. I do not know your city, but in news papers there are various advts re diploma of evey sector, choose one of them and make physical enquiry and join the inst for diploma. Hey! I know this is kinda off topic however I'd figured I'd ask. Would you be interested in trading links or maybe guest writing a blog article or vice-versa? My website covers a lot of the same subjects as yours and I believe we could greatly benefit from each other. If you might be interested feel free to send me an email. I look forward to hearing from you! Wonderful blog by the way!Currently it seems like Drupal is the top blogging platform out there right now. (from what I've read) Is that what you're using on your blog? Thanks for a marvelous posting! I seriously enjoyed reading it, you may be a great author.I will make certain to bookmark your blog and will often come back later on. I absolutely love your blog and find almost all of your post's to be precisely what I'm looking for. Does one offer guest writers to write content for you? I wouldn't mind creating a post or elaborating on a few of the subjects you write in relation to here. Again, awesome weblog! I'm curious to find out what blog system you are working with? I'm having some minor security problems with my latest site and I would like to find something more safe. Do you have any recommendations? I do not even know the way I stopped up here, however I believed this put up was once great. I don't recognise who you are however certainly you're going to a famous blogger if you are not already ;) Cheers! Hi there! This is my first comment here so I just wanted to give a quick shout out and say I truly enjoy reading your blog posts. Can you recommend any other blogs/websites/forums that deal with the same topics? Thank you! My company has grown from $50,000 to $100,000 because the profits the company made and redeployed for business growth. made decides to grow business much more. For this the company needs more plant and machinery. One of the most lucrative things you can do with that skill is choose a good online business system & build your own business part-time from home. A PERSON SITTING ON THE SHORE WILL COLLECT ONLY PEBBLES BUT WHO IS DARE ENOUGH IS ABLE VENTURE IN THE SEA CAREFULLY AND COLLECT PEARLS. I discovered your this post while searching for information regarding blog-related research ... It is a good post .. keep posting and updating information.